subsequently. During the mission, the assessment team met with officials and representatives of all relevant government agencies and the private sector. A list of the bodies met is set out in Annex 2 to the detailed assessment report. capacity, the implementation and the effectiveness of all these systems. standard with respect to financial institutions and nonfinancial businesses and professions. summarizes recommended actions in areas related to the FATF 40+9 Recommendations. than 130 million Euros worth of criminal proceeds in 2004. • Need to ensure the application of a more effective sanctions regime. instrument, streamlining and updating the numerous existing laws and regulations. sectors such as real estate provide a favorable environment to money laundering. temptation for potential terrorists in Italy to finance an attempt on targets within easy reach. 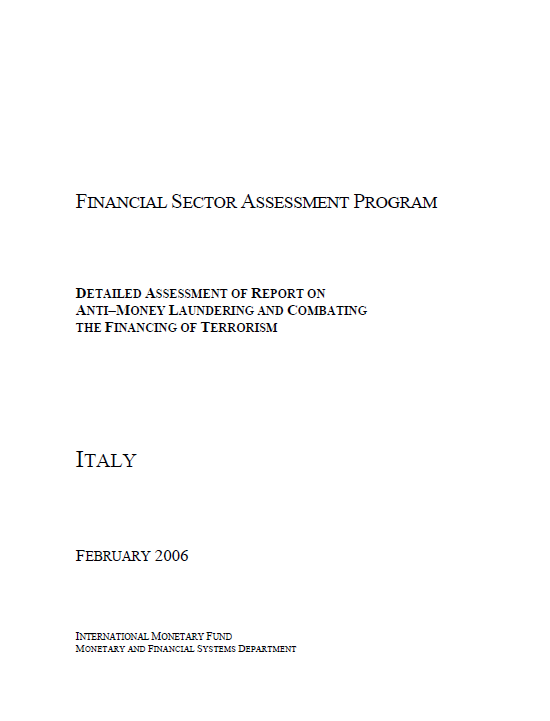 changes made with respect to the suggestions for improvements of the 1997 FATF report. of legal entities in the case of the commission of a money laundering offence (see infra). suspicious transactions, a lot of progress has been made in setting up reporting mechanisms. receive following their filing of an STR. The Guidance Committee instituted by Law 143 of May 3, 1991 has never met. Security Committee (FSC) was established to deal with financing of terrorism issues. were not required to identify their customers. report, the on-site inspection efforts and resources of the GdF still need to be increased.